Cirque du Soleil is returning to the area with its coolest arena show yet — Cirque du Soleil’s Crystal. This unique arena production showcases synchronized, freestyle and extreme skating alongside circus disciplines such as swinging trapeze, aerial straps and hand to hand. Watch world-class ice skaters and acrobats explore their new frozen playground with speed and fluidity as they challenge the laws of gravity with never-before-seen acrobatics. 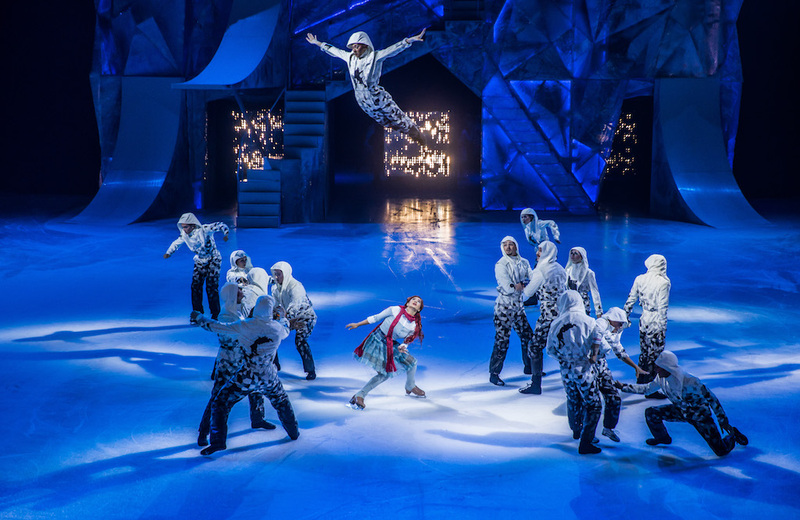 Cirque du Soleil’s Crystal fuses circus arts and the world of ice skating in a stunning new production that will take the audience on a journey into a surreal world where figure skating blends with acrobatics and aerial feats. Once there was a boy who dreamed a star could be his new friend—if only he could catch one. He tried climbing to the top of the tallest tree. He tried flying in a paper rocket ship. But nothing worked. Just when the boy was about to give up, he discovered something as dazzling and special as the star he was seeking! Best-selling author and illustrator Oliver Jeffers’s beloved children’s book about chasing your dreams comes to vivid life in a production created and directed by Jared Mezzocchi. Featuring colorful projections and choreographed movement, How to Catch a Star is a whimsical tale of discovery, friendship, and delightful surprises. Recommended for ages 3+. This wacky retelling of the beloved fairy tale takes Cinderella on a royal adventure complete with a wisecracking rat, evil stepsisters, and a smitten prince. When Cinderella’s stepmother forbids her from attending the ball, her fairy godmother convinces here that if the shoe fits- wear it! True love may await her if only she can put down her sword. Just the right fit for the holiday season! Recommended for ages 4+. In the golden age of radio, Cri-Cri’s irresistible songs and stories enchanted children and families all over Mexico and Latin America. Today, he continues to captivate audiences as our vibrant cast brings his songs to life again in an interactive family show. Come play, dance, and sing along with Cri-Cri and his friends in Spanish and English, and be transported to a sweeter time through music, words, and laughter. All 11-year-old Billy wants to do is dance. While the 1984 miners’ strike squeezes his family and splits his town, Billy’s passion for ballet first divides, then ultimately unites, the community—and changes his life in extraordinary ways. Based on the powerful and acclaimed film, Billy Elliot swept the Tony, Drama Desk, and Olivier awards for Best Musical, by combining a dynamic score by the legendary Elton John with sensational dance to create a heartwarming, inspirational and triumphant experience for the entire family. In 1923, the Broadway debut of Sholem Asch’s Yiddish drama God of Vengeance set the stage for an explosive moment in theatrical history. The evocative work of Jewish culture was praised and criticized for taboo themes of censorship, immigration and anti-Semitism. Inspired by these true events and the controversy, Pulitzer Prize-winner Paula Vogel tells the behind-the-scenes story of the courageous artists who risked their careers and lives to perform a work deemed “indecent.” “Brimming with good faith” (New York Times), this Tony Award-winning intimate and enchanting play filled with music and dance is a testament to the transformative power of art that is timelier than ever before. Experience the acclaimed new production of the legendary musical Miss Saigon, from the creators of Les Misérables. This is the epic story of a young Vietnamese woman named Kim. In a bar run by a notorious character called The Engineer, Kim meets an American G.I. in an encounter that will change their lives forever. Featuring stunning spectacle, a sensational cast, and a soaring score including Broadway hits like “Last Night of the World,” “The Movie in My Mind,” and “The Heat Is on in Saigon,” this is a theatrical event you will never forget. Recommended for ages 12+. Dragons are real and imaginations soar in this wordless Family Theater Production directed and choreographed by Company Member Tori Bertocci. Adapted by Company Member Ryan Sellers, “My Father’s Dragon” is based on the book of the same name by Ruth Stiles Gannett. The story follows the adventures of Elmer Elevator as he stows away to Wild Island in an attempt to rescue a captive baby dragon. This production is a part of Synetic’s Family Theater series and is recommended for ages 5+. The wonder and magic of a child’s imagination are brought to life in this charming world premiere. One cozy winter afternoon, a young girl and her favorite stuffed animal, Mr. Bear, play a game of hide and seek which evolves into a series of exciting adventures. Together they embark on a journey of endless possibilities – all from the comfort of her playroom! Cuddle up with your favorite stuffed animal friend and join us for a delightful holiday production. Recommended for ages 2-5. Instruments speak through music in this interactive, immersive concert for young audiences. Grammy Award®–winning clarinetist and composer Oran Etkin and his band use games, stories, songs, and movement to teach children rich musical and cultural heritage. Examining sounds from Mozart to Willie Nelson to Herbie Hancock, children will explore how music is as unique and magical as their own imagination. Recommended for ages 3+. Tot Rock is Jammin’ Java’s super-popular kids music concert series, providing wholesome family entertainment at one of the DC Metro area’s finest music clubs. Local acts perform every Thursday and Friday, and touring performers drop by on many weekends. Check the calendar often to see when your favorite act is performing, and for other calendar updates. Little ones can boogie along with their favorite local musicians at Eastern Market’s North Hall on Thursday mornings. Even better, proceeds from all shows benefit DC Diaper Bank! Go for the entertainment, then grab lunch in the market or at one of many nearby eateries after. The series presents puppet shows designed for the youngest theater patrons (ages 0-4). They are shorter, the lights stay on, and the doors stay open. They have an arsenal of shows that they switch up every performance, so be sure to check the schedule to see what’s playing when you go. The Kennedy Center presents these free, no-tickets-required performances every day at 6pm, and the public is welcome to enjoy them. The acts span the genres — you can see everything from contemporary dance to folk music to puppetry to comedy shows to opera scenes. Millennium Stage showcases everyone from local youth choirs to internationally known bands (They Might Be Giants performed there a few years ago). This is a great series to keep in mind for whenever you’re looking for some free, easy entertainment. The weekly series welcomes children 5 and under with their caregivers to enjoy a morning of performances and stories from 9:30-11am. Go to one of three locations: Brookland in DC or Takoma Park or Hyattsville in MD. Plan on breakfast, too — full service is available while the little ones are grooving. The arts center in Columbia Heights offers a variety of enriching, entertaining, and cultural activities and performances for children. From Harambe sessions to puppet shows to musical theatre to sing-a-longs, there’s something going on for little ones just about every day of the week. The free theatre program runs on select Saturdays with performances at 9:30am and 11:30am. Musicals, plays, storytelling, and comedy shows are all part of the live entertainment line-up. See the complete schedule of performances here. Tickets are distributed day of performances on a first-come, first-served basis. Everyone must be in line to receive a ticket. Inflatable rafts on the Mediterranean. Dark holds of cargo trucks. Family photos wrapped carefully in a backpack that crosses border checkpoints. Author and illustrator Christopher Myers and director Kaneza Schaal, along with New York–based company Arktype, explore how the world is alive with movement and migration. Inspired by the artists’ creative work with young refugees from around the world, Cartography asks what part we play in the lives of youth who set out into the unsure waters of their future. From the effects of climate change to war and poverty, this powerful story examines the forces that shape where we have come from, how we have moved, and where we are going. Recommended for ages 12+. Encore Stage and Studio presents this by kids for kids production: During the day, A Likely Story looks like any other bookshop, but at night the characters inside the books come alive. Classic characters — including Dorothy Gale, Pollyanna, Heidi, Tom Sawyer and more — long to help Margie, the scatterbrained owner, save her struggling store. When a pair of smugglers come looking for a stolen necklace hidden inside one of the books, the characters must find a way to rescue the bookshop without being seen. Join us on this magical mission to celebrate the enchantment and joy of reading. Recommended for ages 4 and older. This Discovery Theater original scores big in a musical play about sharing and taking turns, the importance of personal space, and the awesome power of teamwork. Five-year-olds Bobby and Casey are aspiring soccer stars and best friends— but they’ve ended up on separate teams! Sharing, personal space and respect are team values in this play about friendship and fun. Recommended for ages 3-6. The world’s largest and most famous monster truck tour featuring the biggest names in monster trucks will thunder its way into DC. Bad News Travels Fast, Barbarian, Grave Digger, Nitro Menace, Pretty Wicked, Monster Mutt Dalmation, and Scooby Doo are among the vehicular beasts you’ll see tearing up the indoor terrain this year. Join American Pops Orchestra favorite, Hilary Morrow (known most recently for her role as Detective Fix in APO’s Around the World in 80 Days), in a madcap retelling of this classic children’s story. Watch as this old woman’s appetite for strange objects transforms her quiet afternoon into a wildly spectacular tale! Use code KIDFRIENDLY to save 10% on tickets. The beloved and inventive childhood classic book, The Phantom Tollbooth, is brought to life in an original stage adaption. Norton Juster’s original story begins with Milo, who is very bored until a tollbooth mysteriously appears in his room. He decides to drive his toy car through it, and everything changes! Once on the other side, Milo is thrilled to find a fantastical world where he is welcomed, and his help is desperately needed. Using puppets, masks, magic, inventive scenic effects, and original music, Enchantment Theatre Company recreates Milo’s adventures as he travels the Lands Beyond in his exciting quest to rescue Princesses Rhyme and Reason. Recommended for ages 6-11. This award-winning band combines South American rhythms with jazz improvisation, sung in six languages for a globetrotting adventure. Banda Magda returns with a lively performance showcasing its new album Tigre, featuring Uruguayan candombe to Greek folklore to Brazilian samba beats. With plenty of audience participation and irresistible rhythms led by accordionist and composer Magda Giannikou, Banda Magda will get the whole family moving. Recommended for ages 7+. In partnership with the Landless Theatre Company, the Baughman brothers bring their wacky take on the Grimm’s tales to the Arts Barn stage. The brothers will reenact their favorite stories including Snow White and The Seven Dwarfs, The Frog Prince, Little Red Riding Hood, and more. Recommend for ages 4+. This Tony-winning gem of a musical took Broadway by storm with its romantic folk-rock ballads and an ensemble that plays its own instruments. Set in contemporary Dublin, a street guitarist is about to give up on his dreams when he meets a curious woman who wants to know all about him. Captivated by her optimism, the two embark on a remarkable music-making journey that includes a cadre of unlikely companions — immigrants, oddballs, and lonely hearts. Along the way, can the two of them find love? Based on the 2006 film which won an Oscar® for Best Original Song, Once ponders the mysteries of music and love. Recommended for age 13+. Meet Anatole – mouse magnifique – the best cheese-taster in all of France! In this whimsical musical adventure, Anatole and his best friend Gaston set out to save the Duval cheese factory, only to discover something much scarier than moldy Brie lurking in the tasting room. Can Anatole outsmart the hungry predator and save the factory? Join Anatole, Gaston, and a chorus of dancing cheeses to find out! Recommended for ages 4+. The Big Apple Circus is returning to National Harbor, featuring spectacular stunts under the big top. Known for its one-ring, artistic, European-style, no seat is more than 50 feet from the performers. That’s perfect for viewing some first-ever feats for the Circus along with fan favorites. Hire wire acts, contortionists, bicycle acrobatics, hilarious clowns, and doggie dances are some of thrills and fun you can expect. Read a review of one of our past experiences at a Big Apple Circus show. A “bewitching” tale by Duane T. Bowers, adapted from the Brothers Grimm fairytale. Witch Wartsmith wants a baby, and after bargaining for little Rapunzel, must go to great lengths to keep her out of the hands of a handsome prince. The Puppet Co. uses “coloring- book” charm and the simplicity of hand puppets in a production designed to delight its younger audiences. From the beginnings of time, we have gazed into the night sky with wonder and curiosity at the moon shining down on us—and wished that we could journey there. In this enchanting new show for the youngest audience members, performers and puppets spin new and old stories about the moon’s magic and introduce the exciting Apollo mission that brought us to its surface. What new worlds can we dream about next? In this adaptation of the best-selling novel by Rick Riordan, the Greek gods are real, and they’re ruining Percy Jackson’s life. As a son of Poseidon, Percy has newly discovered powers he can’t control, monsters on his trail, and is on an epic quest to find Zeus’s lightning bolt to prevent a war between the gods. Recommended for ages 8+. In this original play by Josh Wilder, Krystin, Jaleesa, and Amber form a double-dutch team in inner city Philadelphia to compete in their neighborhood pageant. If they win, they’ll receive a special prize: their futures told by Ms. Mary, the local psychic. Will they become a famous singer? A hair dresser? Or maybe a “gem,” a special leader who cares for the neighborhood? Then they meet a pregnant teen from North Philly who can jump double-dutch almost better than any of them. Just as the girls anticipate learning about their futures, they’ll learn something important about her past that affects them all. Recommended for ages 12+. Experience the genius of Charles Dickens through the eyes of a young boy! Follow Davy Copperfield on his childhood adventures in 19th C. England. Whether at home with his mother, at boarding school, working in a London bottling factory, or making his epic escape across the English countryside, Davy shows his resilience and determination to find a loving home. Recommended for ages 6+. Virginia National Ballet presents Aladdin! Be transported to exotic lands and follow Aladdin and Jasmine on their journey in this world premiere of Rafik Hegab’s choreography. This family-friendly production features VNB’s fantastic, international professional dancers, amazing choreography, beautiful sets and costumes, and great music. The annual Intersections Festival presents work that impacts our society, culture, and world by informing, inspiring, educating, and entertaining. INTERSECTIONS is about showcasing excellent art that inspires a connected community, engaged artists and audiences alike, and creates a vibrant neighborhood, city, and world. In addition to the main festival performances, Intersections, also always includes special Family Fun Days. As childhood friends growing up in Denver Colorado, Joe Mailander and Justin Lansing were always exploring the outdoors. Now, as the GRAMMY® Award-winning Okee Dokee Brothers, they have put this passion for the outdoors at the heart of their Americana Folk music and hope that it will inspire children and their parents to get outside and get creative. The Okee Dokee Brothers are four-time winners of the Parents’ Choice Awards, three-time Grammy® nominees and one-time Grammy® Award winners for their recent albums. The unknown frontiers of the universe have captivated composers for centuries. As the 50th anniversary of the moon landing draws near, join the NSO for a fun-filled concert of interstellar proportions. Tap into your imagination and be transported from the Concert Hall to outer space. Recommended for ages 5+. Children’s music fave Laurie Berkner is bringing her Greatest Hits Solo Tour to the DC area for two shows on Sunday. A true pioneer in children’s music, beloved by generations of children and parents for over twenty years, she’ll be playing well-loved hits like “Bumblebee (Buzz Buzz)” and “We Are the Dinosaurs” along with newer songs. Kids should plan to bring their dancing shoes and a stuffed animal (for their heads). FYI: We took a toddler Owen to one of Laurie’s shows years ago, and it was so much fun! Dare I admit I actually knew the words to almost every song?! Based on the critically-acclaimed Academy Award® winning film, Finding Neverland tells the incredible story behind one of the world’s most beloved characters: Peter Pan. Playwright J.M. Barrie struggles to find inspiration until he meets four young brothers and their beautiful widowed mother. Spellbound by the boys’ enchanting make-believe adventures, he sets out to write a play that will astound London theatergoers. With a little pixie dust and a lot of faith, Barrie takes a monumental leap, leaving his old world behind for Neverland, where nothing is impossible and the wonder of childhood lasts forever. The magic of Barrie’s classic tale springs spectacularly to life in this heartwarming theatrical event. With a mix that covers everything from jazz to gospel, spirituals to show tunes, and classical to contemporary, D.C. ’s own Urban Nation H.I.P. H.O.P. Choir showcases the power of young talent—and the astounding power of music in our lives. In a high-energy performance full of rich harmonies and plenty of audience engagement, this talented ensemble’s musical message of self-empowerment rings out loud and clear: Lift your own voice so you can be heard above the crowd! Encore Stage and Studio presents this by kids for kids production: Prince John and the Sheriff of Nottingham are cruel and unfair to their citizens. Robin Hood and his merry men are on a mission to help by taking from the rich and giving back to the poor. To arms! When the Sheriff and Lady Merle hatch a plan to stop him, Robin Hood must save Maid Marian, defeat the awful sheriff, and secure Nottingham for the true king’s return. Recommended for ages 6+. Drummer Kofi Dennis brings the vibrant life of a West African village to the Discovery Theater stage though music, storytelling, and dance. Using authentic instruments, the Ghanaian native leads lively call-and-response songs, games, and movement that gets audiences on their feet in a high-energy exploration of African cultural traditions. In their signature pink ties (on the guys) and pink-and-black tutus (on the girls), the Not-Its! rock kids and families with their up-tempo albums and performances that give children their first “rock show” experience. The Seattle-based quintet delivers on-your-feet, action-oriented songs like “Green Light Go” and “Skateboard,” and uses music to empower kids to be innovators, protect the environment and wildlife, and be proud of who they are—even if, as they sing about in “Participation Trophy,” they get third or fourth place at something. Recommended for ages 2-6. When: March 3, 2pm & 6:30p.m. Experience American Girl® in an all-new musical! American Girl Live features original songs and unforgettable experiences. The show invites fans along to a sleepover camp with some new friends for an exciting summer away from home. As bold tales of bravery and friendship come to life, iconic American Girl characters lend a hand through story and song. VIP ticket packages available. On a warm spring day, the friendly tune of the ice cream truck might be just what you need. But when one particular ice cream truck starts to fall apart, the drivers have to fix it before everything starts to melt! Will our friends find a way out of this sticky situation? This highly physical comedy features live percussion music and plenty of zany shenanigans. Come help us figure out how to fix up this ice cream truck where nothing goes right! ​Recommended for ages 2-5. Meet the Watsons of Flint, Michigan: Momma, Dad, little sister Joetta, big brother Byron, and ten-year-old Kenny. When Byron can’t stay out of trouble, the whole family piles into their “Brown Bomber” and drives south to visit Grandma Sands for the summer. But along the way, they’ll experience a pivotal moment in the Civil Rights Movement. Recommended for ages 9+. Pinkalicious cant stop eating pink cupcakes despite warnings from her parents. Join Pinkalicious and her friends as they tell the story of the girl who turned pink! Based on the beloved children’s book, this family-friendly show is perfect for all ages. Is there a great show running soon that you don’t see listed here? Let me know in the comments, and I’ll add it! The Percy Jackson musical is $39 to $139. Not $20. Oops! Thanks for catching that! Thank you for collecting and sharing!